There comes a certain point as a filmmaker in which your stretched too thin. In order to make more money you know you must take on more projects. But more project means more of your time spent scripting, filming, editing and other post production activities. Eventually this model of selling your video production services leads you to being burnt out, less time with your family and friends, less time to work on creative passion projects. Darryl was very much at this point when he discovered Next Level Creators. What grabbed his attention was the idea of no longer selling his time for money. Instead, he wanted to make consistent monthly income while scaling his video business, all while spending more time with his newly born daughter. So he joined NLC and was able to turn his first three commercial campaign clients into $72,000 in recurring guaranteed revenue. Listen to the full interview to learn how he did it, and how it has impacted his life as a creative filmmaker. Paul Xavier: Hey, everyone. Paul Xavier here, and today I have a special guest, Darryl, with me all the way from Australia. What part of Australia are you in, Darryl? Paul Xavier: Melbourne? Yeah. 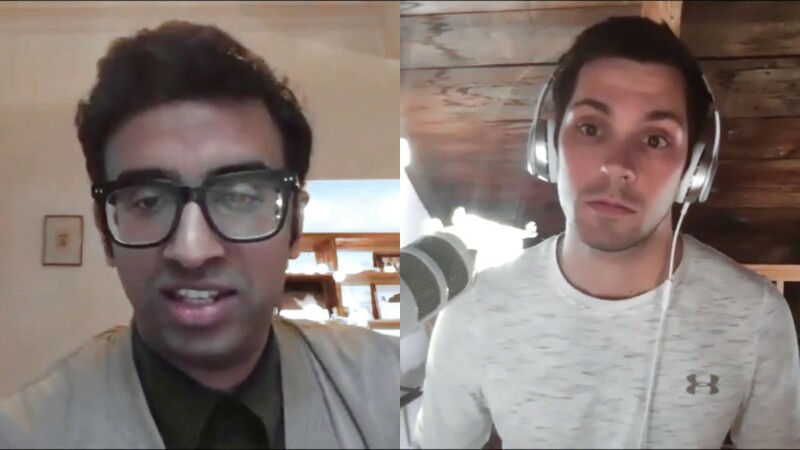 He’s going to share his journey, which is a pretty remarkable journey so far, as a video creator, going from doing project to project, really building the traditional video production company, which he scaled to a significant income for himself, to joining the Next Level Creators program, putting a different model in place, getting recurring revenue clients, and what that’s been able to do for him so far. Paul Xavier: Darryl, thanks for joining and sharing your story, of course. What got you into wanting to be a video creator, and wanting to do video production for people as a job, and as a career path? Darryl Ephraums: Well, actually, it’s a pretty interesting story, at least for myself. The main reason why I started doing video was because I couldn’t get a job. I’d had various other jobs, and I’d been involved in a lot of creative, artistic practices. For whatever reason, I ended up at a certain point turning 30, where I couldn’t get a job, despite having some of the best qualifications you can get, and a lot of track record in jobs. Darryl Ephraums: At that point, someone paid me to hold the camera, because they knew I was handy in production, and that gave me some money, and I thought, oh, that’s nice money. Then they paid me again, and I though, oh, that’s nice, again, a bit more. A bit more over here, a bit more over there, people just kept on hiring me. From there, I guess a video creator was born, and I just kept on pursuing it because at that stage, it was what was helping to feed me and pay the rent. Darryl Ephraums: Quite contrary to getting into it for creative ideals and because you want to make beautiful art, I just got into it because it paid me money. I was lucky enough that it also allowed me to make beautiful art at the same time, as well. Paul Xavier: Yeah. That’s great. You actually got into it out of necessity rather than what a lot of people do is, hey, this is my passion, this is my dream, and you were like, it wasn’t so much that. Has it turned into that for you at this point, doing creative work and being a video creator? Darryl Ephraums: Yeah, absolutely. I’ve always been, I think, involved in the creative arts or the humanities in some respect. The principles that underpin one aspect of the arts, underpin all of them. If you understand the composition of music, of literature, et cetera, you understand also some of the practices that go into visual art. I was able to sort of side step around, but that key factor of doing it because someone was paying me was what drove me to where finally, I guess, crack it and start to make a living. Paul Xavier: How long ago was it when that first person paid you for a video? How many years? Darryl Ephraums: About four years ago. Paul Xavier: In your first year, how much did you make, would you say, roughly? Darryl Ephraums: Out of video, probably about 10, $15000. Paul Xavier: Sounds about right. Then second, third year, fourth year, how did things start to progress? Darryl Ephraums: I think the next year was about 22000 from the video. I was real lucky that my partner was having a full-time job at that point, which gave me the freedom to ignore the fact that it was only $22000. And just think, yeah I can do this, I can do it, come on. Next year, I think was about 35000, and then this current financial year, it’s been about 115. I guess those first three years, you slave for it, you-re really results-focused with your work, you’re willing to do anything, and then you can cash in on that in your fourth year, fourth for me at least. Paul Xavier: Yeah. Just to be clear with everyone who’s listening here, this is a traditional video production company. You are going out, you are selling a video project, you’re selling it based off of hours. Right? Hours and quality, and these things that that’s what you are building, selling your value off of, and you were able to scale that up to 120K a year. For a lot of people, that’s a ton of money. That’s an amazing living for a lot of people. Paul Xavier: For you, getting to that point, what was it like when you were at that point? You had your first $120000 a year, where was your mindset at about the business, and what was going on? Because that was really right when you decided to engage with us. What was happening there that made you look at the creators operating system, and Next Level Creators, and say, this might be a good idea? Darryl Ephraums: Really, it’s question of time, and the lack of it. At a certain point, your goals are, can I be shooting five days a week? How productive can I be as a video creator? Then you get there and you realize, five full days of shooting means seven full days of post production, as well. It means not being able to find other people that can do the work, or the post production work at the level that you think it needs to be done. You very quickly run out of time. Darryl Ephraums: To give you a clear idea, I guess, of I think summarize how I felt, when you talk about selling on hours and selling on quality, my big differentiator to competition has been lighting, cinematography, so being able to light things in a cinematic way, make images look beautiful on small budgets. What that essentially means, though, is carting around lighting equipment, going to a rental warehouse, picking up gear, taking it out to the shoot, setting it all up, packing it all down, taking it back to rental house. Darryl Ephraums: When time starts to run out, that back-breaking labor starts to take its toll. You’ve got family things to worry about, you’re just out all the time, you come home feeling like you’ve aged 20 or 30 years in a day. It’s hard work. It’s really, really hard work. Darryl Ephraums: Even though the money’s starting to come in, you’re thinking, well, what happens for the next 10 to 15 years? Is this what I do? How does this actually change? Do I just either plateau at 120000, or can I double it by doubling the price? How much physical labor can I actually do here? How much are people willing to pay for this? You can’t define the value because you can’t see a clear return on the work you do. It’s just the perception of the quality, and it’s also just the amount of time that you put into it. Paul Xavier: Yeah. It’s interesting because when you get to that point, which, I mean, that’s a lot of people don’t make it to that point because they get burnt out. Right? Compliments to you. You had the hustle for it. Then, when they do get to that point, it’s this thing of, oh, I had no time anymore because I’m always shooting. Paul Xavier: It’s a never-ending process. Job, job, job, shoot, shoot, shoot, shoot, the referrals are coming in. You don’t really have to worry about that because your quality’s great, but you have no time. So, how do you scale this thing and make more money? Well, you can hire people, but then the margins go down, and if you hire people, the quality tends to go down a little bit. Then you start putting that out there, your selling proposition starts to get weaker. Almost everyone can just walk away, these people you’re hiring, and then get clients, too, so you have the management problem. Paul Xavier: I see that quite often in the video production industry. What was it about Next Level Creators that kind of clicked the light bulb on in your head at that point? What was attractive to you about commercial campaigns and running those as the model that we help people put in place? Darryl Ephraums: Well, I think the reason Next Level Creators initially appealed to me, was that there was a message in it, which was not just about making money, but which understood where I was at without us ever having met. It understood when you get to that certain point of breaking six figures with a year on a pure video production model, that you’re going to start to run into problems. You’re going to start, at that point, no longer just thinking, how much money can I get? You’re thinking, how can I make the making of money sustainable, fulfilling? How can I get balance into my life? How can I do the things that I want to do, but do it in a way, which is on my terms, and not just chasing and following everyone else’s demands? Darryl Ephraums: There was something about Next Level Creators which understood that particular challenge for me, and was presenting a solution that would take me out of that maelstrom and put me into a situation where I’d be in control. It wasn’t just something that says, hey, join something and we’ll make you money, it was understand the real problems of people’s businesses, and change them for the better. Paul Xavier: Yeah. I say that all the time. If you’re an entrepreneur, and your goal as a video creator is to make something beautiful, if that’s all you want to do, you’re not really and entrepreneur. You’re someone who wants to make art, which is great. That’s a great thing, and some people can make money from that. I don’t really know how, but if you want to be an entrepreneur, you need to be thinking about how to create an impact for your clients, for your audience, for the people you are deciding to serve with your business. The only way to do that is to look at what everyone else is doing, and say, how do I 10X the value for my clients? How do you take it to the next level? Paul Xavier: It sounds like that was really the key thing that clicked in your head was, oh, if I can get these people multiple commercials, or one commercial that’s distributed, and get results, that is what was really exciting, was creating that win-win relationship with them. Is that right? Darryl Ephraums: Absolutely. I guess, a really driving motivation for me, which others might be able to identify with is, producing work, which other than skimming the value off. As a creator, you’re always making stuff, and you might be working hand-in-hand with another agency, or another marketing group of some kind that don’t have the creative expertise in-house, but a simply in control of relationships with clients. Darryl Ephraums: You go ahead and you do the work, which is then generating massive value for those clients, and for the middle man and the middle woman. It was also about seeing some frustration in being in that position, the lack of power. I called it being a powerless creative. You need to know your value, and you need to be able to define the value purely financial terms, or you’ll always be stuck in that position of being squeezed by others. We don’t think you need one day to do this, we think you can do this in three hours. That kind of thing, if you’ve ever felt that before. Those of you who might be listening, you’ll know that that is really, really annoying, someone telling you, yeah, you can do this in two hours. Darryl Ephraums: Then you produce something amazing for people and they make a lot of money off it, and then you think, well, what’s stopping me from being the one to control the situation? I might be a little bit presumptuous here, but I feel, personally on the marketing side, you can learn the systems, you can learn the mindset, you can learn the approach a lot quicker than you can learn some of the aesthetic skills that go into creative practice in video making. Darryl Ephraums: Some of those things might take you a lifetime. You’re never going to be where you want to be with them. You’ve started when you were six years old, and you’re still going all the time, all the time thinking, how can I get better at this creative side? Other parts, you can learn very quickly on the job. Darryl Ephraums: The way I rationalized it was I’ve been doing my 25 year apprenticeship in creative filmmaking, that’s the hard bit done. I need to go learn that part that others are doing, and learn it quickly, and then make use of it myself., to be in control. To be in control of earning the full value of what my skills can bring me. Paul Xavier: Yeah. Since you’ve joined, you joined Next Level Creators back, basically, February, the very beginning of February. So you and I have been working together for four-and-a-half months at this point. What have you done so far? What have you accomplished in that four-and-a-half months? What’s changed for your business? Darryl Ephraums: I think it’s a mindset shift, first and foremost. I mean, there have been some practical changes, which we’ll get to, but first and foremost, mindset. Knowing that it is now okay to say no to a lot of things, and to focus on one thing. Before, when you’re working project to project, and based on time, you were thinking, how much can I do? Because you’re always worried that there won’t be a project next month. Darryl Ephraums: That’s always on the back of your mind, so you need to just do as much as you can. Anything that comes, even if it’s outside of your niche, someone wants you to do something ridiculous video project, you just think, this is utterly stupid, but I’ll do it, because you know what? I want to make sure that I’m going to break six figures, I’m going to do that. Darryl Ephraums: I guess the point I’m trying to make is I think you’ve shared with us the story about the quote from Steve Jobs, which talks about success entrepreneurism is about saying no to a thousand ideas or a thousand bad ideas, or could have been ideas, to focus on one thing. What Next Level Creators provides you is that clarity to focus on one thing. Darryl Ephraums: You’re no longer thinking about how many products can I accumulate? How many people can I meet? How many pro-bono jobs could I do with people in order to just create relationships, which takes time. You do a pro-bono thing because you think you want to foster a relationship, that can end up in three or four days of work if you’re not careful, because you’re wanting to make a good impression, and you want to really impress that particular potential client. Darryl Ephraums: All that stuff takes a lot of time to get work moving. Next Level Creators clears the desk of that and gives you a simple model, which essentially means predictable, recurring income on a monthly basis, and then how many different clients can you add to the list and comfortably? Not just to scale for the scaling sake, but to scale people successfully, to scale it so that you make an impact for them. Darryl Ephraums: Very quickly, I was able to take away the stress of, where am I going, over the next 10 years, and it was more just about what are the results that I can get? As soon as I can get results the next 10, 15 years is fine. That is no longer a concern for me where things are going. Darryl Ephraums: It flipped around, actually. I had this explanation to someone yesterday. I used to worry about where things are going, but the short-term was completely fine. Now, it’s the other way around. It’s like I’m not worried where things are going, it’s the short-term that I am focused on like getting the results right now. Paul Xavier: Yeah. That’s doing what’s best for the client. Right? If we can help the client right now, today, improve their life, and make more money, get their message out there, get more clients and grow, then we’re protecting our long-term interest. That’s going to be just fine. Right? Paul Xavier: It’s funny, because you mention that quote by Steve Jobs. Steve Jobs, he was talking about, it’s more important to get rid of the 1000 good ideas that you have and focus on the one that’s great. That’s what focus really is. There’s always another bus that’s going to come by, another opportunity. When it comes down to it for you, figuring out that hey, if I can deliver results to people, they’re going to keep paying me. I just have to get a couple clients and deliver those results. Paul Xavier: Right now, how many clients have you been able to add since you joined, for commercial campaigns? Darryl Ephraums: Yesterday, we just signed on our third Next Level Creators client. To be honest, for the first one or two months of being in the program, I was barely even able to look out, I was so busy with the old business model. I couldn’t even find the time to sit down and focus on it. I started to get really frustrated about the old business and wanting to just slap away all those old clients and just focus on this, because that was starting to get on my nerves. Darryl Ephraums: As soon as I did manage to make that time and get into it, there was initially a period of frustration, not understanding exactly whether it was the right fit for me, even though I think I knew in my heart that it was, but still, there is always resistance because you want to do things the way you’ve always done them. To change your mindset can be such a painful thing to do when you’re stuck in one set way. Darryl Ephraums: After that little period of adjustment, then I was quite able to quickly bring in three clients, and yeah, very happy with that. So, thanks for your contribution to that, as well. Paul Xavier: Of course. Thank you for being a hard worker. That’s all it takes, right? If you’re willing to put in the work, you can change, but if you’re not willing to do the work, if you’re not willing to look in the mirror and say, is this the right thing for me because what I’m doing right now, it’s really not what I want. Am I willing to get uncomfortable, do work that’s outside of my comfort zone, to grow? Because that’s what it takes. You did it. Paul Xavier: Now, with these three clients, how much revenue … Because basically, the way a commercial campaign works, for anyone who’s listening and doesn’t know, you have your video production fee, where you’re setting up the campaign, you’re producing the commercials, then you have your management fee. Paul Xavier: That’s what we’re really after, because we want the relationship, the long-term relationship where the client, as they grow, they can spend more money with us, and actually incentivize to do that. They spend 2000 with you now, they make 20000, tomorrow they spend 4000, they make 40000. This is the relationship we want to build. Paul Xavier: For you, how much revenue has this brought in for your business on a monthly basis right now with these first three clients? Darryl Ephraums: There will be a setup aspect of a commercial campaign and the monthly retainer. The monthly retainer side, I think we’re at about 6000 per month. That include capacity to … There’s a variable aspect to that depending on how far we can scale. So, 6000 would be the minimum. If we were to scale some of these businesses anywhere from 5 to 1, to 10 to 1, that figure could easily double in a month. We’re happen we’ve been able to negotiate that aspect of it. Paul Xavier: Yeah. Already, the minimum is 72000 a year, because that’s 6000 over 12 months. If and when you get them results, that exponentially grows, massively and fast, which is the key. That’s what we’re excited to do. Paul Xavier: That’s a good thing, too, because think about it. Your incentive is in the right place. If I’m the business owner, and I hire you, Darryl, I want you to be incentivized to get me results, and that’s what we’re doing. That’s what this win-win relationship’s all about. It’s about making those connections. You grow, I grow, the whole pie gets bigger. I’m not taking a piece of the pie, the pie’s getting bigger. That’s awesome. Paul Xavier: For you, on a personal side, what is this … You mentioned to me before we started the interview, you were just about to have a baby. Did you have your baby? Darryl Ephraums: Yeah. She turned one year old yesterday. Darryl Ephraums: Yeah, she was born right when things really picked up on the previous model. Of course, it all has to come at once, so I was working project to project. Hours were scarce, I had a new baby, I had a partner who was a new mother battling away with that particular challenge. I wasn’t able to support her as much as I wish I could have because there was always that fear of placating. If I’m here at home with you all day, I’m not making money. There was always that challenge to get back out there and work, work, work. Darryl Ephraums: I guess how things have changed for me is a sense of peace, really. I know that doesn’t have bells and whistles attached to it does it? But a sense of peace allows you to focus. It takes your head out of the anxiety that I think comes with being in an unstable, precarious income for certain people who don’t have that assurance that whether I don’t work hard, or whether I sky off work, who cares, because at the end of the day, there is still that forthright wage that comes in. Whereas for those of us on the other side of the fence, we know we can never think that way. We need to keep going all the time to earn money. Darryl Ephraums: There is a price to pay for that, not matter whether you’re earning 10 grand a year, or 200k, you’re that way. There’s always a price to pay or that, and it’s the fact that you are anxious somewhere deep down inside of you, anxious about what the future holds. The peace that NLC sort of brings is that knowing where the pathway lies. It just becomes, then, about implementing and taking action. Paul Xavier: Yeah. That’s a great way to put it. I’ve never articulated that way, but I think you’re right. I went through the same thing in my business. I was running around like a chicken with its head cut off, just doing everything for everybody, the generalist entrepreneur trying to make money. Paul Xavier: Then finally, I found specialization, commercial campaigns, and as soon as I got my first client results, and they reached out and said, you generated us a ton of sales. I didn’t even really know how to do the tracking at that point. I was just like, I don’t know what I’m doing, but it worked. That’s when I just got to take a breath and a sigh of relief where it was, I’ve got something here. I know I’m going to be okay. That’s really good. It makes a lot of sense. Paul Xavier: It’s funny, you mention your big leap forward, your increase in revenue happened right as your baby was born. I don’t think I know a single person who has had a child and not … It’s an uncomfortable situation. The moment you have a kid, you’re like, I’m uncomfortable. I’ve got to figure this out. I’ve got to do something. It puts you into that state where you have to grow. You’ve got to develop into the person who’s going to be able to take care of this individual because that’s your responsibility. Paul Xavier: Everyone I know who gets in that state, they’re more committed than any time ever. That’s the best time to try to make a huge leap forward in your life. That’s awesome that it happened for you. Darryl Ephraums: The challenge for other people is to not wait until it becomes that point in their life, that point where the baby’s coming and you’re thinking, I’ve got to change things here. Do it before you have a kid. Paul Xavier: I agree with that, 100%. It’s interesting because a lot of people, if you were to tell someone right now … What would you do if you wanted to recommend Next Level Creators to someone who’s doing the traditional project to project, they’re making 60 to $200000 a year, they’re looking to, where’s the reliability? What would you say to that person who’s thinking about waiting? Who’s thinking about putting it off and saying, now is not the right time. I don’t have the resources today. What would you say to that individual? Darryl Ephraums: I’d say that what you’re doing by going into Next Level Creators is creating a type of freedom for yourself. It’s not necessarily the freedom that you understand when you’re on the other side of the fence. I guess what I mean by that is when you’re doing a creative practice, you think what you’re doing is like, I’m being free, I’m going against the man, I’m not working for the dollar, stuck in a job. I’m out there doing what I want for myself. Darryl Ephraums: Unfortunately, it’s just another type of prison. It is in a way. Whether you’re in a 9:00 to 5:00 job with one boss, or you’re freelancing with 100 bosses, all pushing you in different directions, you’ve swapped one prison for another, as far as I’m concerned. Darryl Ephraums: What I looked at, and what I’m looking to get out of Next Level Creators, is to create freedom for myself to pursue things on my terms once I can set up my business to run with a model which is scalable, which does give me predictable income, which does create room and time in my life to pursue other things. Darryl Ephraums: I don’t necessarily look at Next Level Creators as a way of getting everything that I want out of video production in the sense that I don’t look at it and think … What I want to do in shooting fashion and beauty, and shooting beautiful skin, that’s not necessarily what will get results. I need to be focused on getting results for clients. Once I get those results, and once that turns into predictable income, outside of that, I will have freedom and time to pursue shooting film just because I want to. Shooting some artistic documentary or whatever, just because I want to. Darryl Ephraums: I happen to think that because it’s for those … When I’m creating under a bit more of a free situation, that work will also be better and will also lead to pursuing that pathway a little bit more strongly. I kind of find that instead of trying to get all of your goals out of one thing, you got to look at the different stages you take in your life as serving different purposes. Darryl Ephraums: For me, personally, Next Level Creators is about getting set up with a predictable, recurring income model, which delivers results, which establishes my reputation and gives me freedom to pursue other things I want to do elsewhere, creatively. Paul Xavier: Yeah. With here you are now, Darryl, you’ve really expanded your business, your horizons are starting to open. I mean, when you think about it, you’re so young into this model, you’re only two-and-a-half months in with your first three clients, which is such an exciting time. Where do you see yourself in three years? How do you see this changing and shaping things for you over the next couple years? Darryl Ephraums: Well, I’m not really a long-term thinking guy, like I said earlier. The brilliance of Next Level Creators is that it’s taken away that stress for me. I’m looking to, as I say, bring in around anywhere from 10 to 20 clients. I have a business partner now, and so our ability to sell on is a little bit more stronger than it was when it was just me. Darryl Ephraums: So, 10 to 20 clients, clients that we can deliver really strong results for, have that predictable model buy a house, get that stuff sorted out, and make sure that we’re set up for that next 30 or 40 years, that there is some stability in our lives. Then from there, pursue the creative projects I want to pursue. Not just necessarily shooting things because people are paying me to do it, but shooting it because I believe in the ideas, and the causes, and the stories that there are to tell, and to do that free of the imperative of money. Darryl Ephraums: It’s funny, I want to create a basis using money in order to create the freedom to do things where money is not an issue. Darryl Ephraums: That’s my plan, basically. Paul Xavier: It’s a good plan. That’s a smart way to do it. That’s how I’ve done it, and it’ll continue to pay you dividends by focusing on what’s important for you and your family right now, and getting those structure in place. Paul Xavier: Like you said earlier, as a creative, when you trade that 9:00 to 5:00 job to work for yourself, you’re responsible either way. Whether you have a job, you’re responsible for your income, you’re responsible for the value you’re providing to that employer. You’re responsible for making their life better, because that’s what a job is. Same thing when you go and work with 100 clients in video production, you’re responsible for the value you provide. When you deal with commercial campaigns, it’s just a simpler model where things are on your side to where you have more predictability, more reliable things, but you’re still responsible all the time. Paul Xavier: I see creatives say, I don’t want to be a numbers person. I’m like, you don’t have to be a numbers person, but you need to be a responsible person. Okay? Those are the same thing. That very much makes a lot of sense to me. Paul Xavier: Hey, I’m really happy that you decided to join. It’s been an honor to work with you so far. I look forward to doing another interview in a couple years to let people see where you’ve made it and what you’re doing then. I really appreciate you sharing your story and everything. Paul Xavier: Is there anything else you’d like to share with people about yourself? Whether this is someone who’s in the fashion industry and interested in possibly working with you, or anything about where people can contact you? Darryl Ephraums: I would say, just responding to what you just mentioned earlier about the creatives that say that they don’t want to do the numbers game, they want to stick to being creative, to someone like that, I would say, yes, I’ve been there. I’ve been in that head space. The best of all intentions and sticking to those sudden ideals, whether you want to hear this or not, that grinds you down eventually. That will grind you down. Darryl Ephraums: Unless you can create the perfect conditions to express that creativity, there will come a point where you will be burned out from the resistance of trying to hang on to your creativity on your terms, and you’ll only work on this if it’s something that you want to do, et cetera, et cetera. You can’t maintain that forever. It’s a lot easier when you’re 21, you just think “F” the world, whatever, I’m going to pursue this. This is what I want to do. Darryl Ephraums: Time takes its toll after a little while, and you’ve got to then work out how to make sure that your skills can plug into the commercial system in a way to make money. I mean, that’s the reality for me, it doesn’t mean that I don’t pursue things on a purely creative basis. I certainly do, and I still have those projects running, but I guess I’ve wised up on one aspect of the way I spend my time each week. Paul Xavier: Yeah. I appreciate that, and I appreciate you sharing that because in a sense, you just had a fatherly talk with a lot of people. That’s the father in you right there. In a sense you’re like, hey, anybody who’s listening to this, I want to parent you for five seconds. Give me your ear. I went through this. Darryl Ephraums: I hope I didn’t sound condescending or patronizing. It’s just my personal experience. I’ve been there, I played as a professional musician, I’ve done a lot of creative practice. I’ve always done it off my own initiative. There’s probably a lot of other people listening who can identify with that. Darryl Ephraums: The key is to not hang on to those ideals, burn out after eight years, then go and get a job. That is not an option. You have to take the skills that you have and make sure that you sustain-ably use them in a way which means that you can prolong the lifespan of doing creative work, not burn out with it. Darryl Ephraums: I’ve seen so many people who are young, they love their artistic practice, and then, no, you can’t earn money doing this, and then it comes too hard and then, oh, I go get a job and get serious. Now more than ever, you can take creative skills and get serious with them and make them work for you, long-term. Darryl Ephraums: That’s what I’m finding with Next Level Creator clients coming on board is that they’ve been dying to wait to hear from someone like me. When I was just making video for them, and they love the video, the fact that I now come up to them and say, I’ll make the video and I’ll try to guarantee the return on investment. They’re like, great. Why have a middle man agency contracting out a creative? Why not just get this creative person who we really love their work, to help drive returns for us? They actually like that. I think they see the common sense in that approach of cutting out one part of the chain and just going straight to the source. Darryl Ephraums: That’s what they want. It’s out there, you just got to go out there and do it. For us, it’s about slowing down on the selling side now, and focusing on the results. We still have sales meetings coming up and now we’re thinking, God, we don’t want to bring on too many more clients. We need to be focusing on delivering results for people. Paul Xavier: What a change that is, right? That’s awesome. I love it. Paul Xavier: Darryl, I really appreciate you sharing your story. To anyone who wants to reach out to you, where can they find you? Darryl Ephraums: They can come to our website, which is thevisualeconomy.com, and on there, they can submit a form, or they can find me on Facebook, just under my name, which you can flash up on the screen if you like, or link me in, wherever. Just track me down on Facebook, send me a direct message, and I’ll chat with you there. Paul Xavier: Awesome. Thank you, Darryl. Much appreciated. Darryl Ephraums: You’re welcome. Thank you.